Mobile 2FA is free plugin aimed at strengthening your HostBill admin area protection. With mobile two-factor authentication your staff members will receive a one-time passcode upon login. This method of two factor authentication can be enabled/disabled per staff member. The message the admin receives with the passcode can be easily edited in message templates. 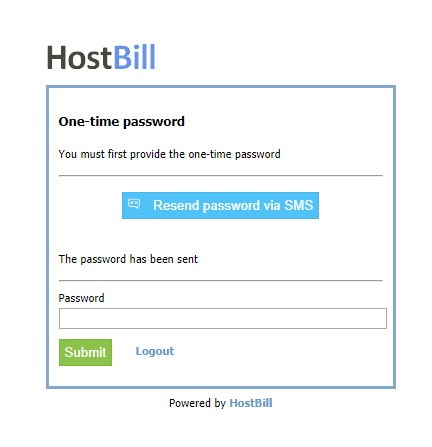 For this module to work you need to enable one of HostBill mobile notification modules and active mobile notifications setting. Our extensive list of payment gateways supported by HostBill keeps on growing. The new addition is TrustPay – a provider of online payment solutions and a principal member of Visa, Mastercard and UnionPay. Founded in 2009, TrustPay belongs to first financial institutions within the region to provide secure e-commerce payments across EEA area. Now you can process payments in HostBill using TrustPay gateway! The client can copy the password only once and after that the link expires. Knowledgebase is a perfect support tool to help you save some time on client support allowing them to browse various how-to articles divided into different categories, easily browsed and filtered by your clients. We’ve now added the option to manage (reorder) articles in a tree view. Also, it’s now possible to search through Knowledgebase and Macros entries in ticket view so that searching for a given article is now even easier! HostBill allows you to choose between two invoicing methods: Default Invoicing and EU invoicing method, where pro-forma invoices and paid invoices have separate numeration. With the new release we’ve added the option to fully block ability to edit invoice with Final ID issued. Enabling the option Block final invoice edits (by default it’s off) will mean that the staff member will not be able to edit/update invoice once final number will be issued for it. When the invoice is blocked the admin will only be able to change the invoice status, add payment or edit payment method. For the full list of features added and bugs fixed please refer to our changelog.